If you’re like me, you might not have the best-quality tools for making coffee, so you have to do the best you can with what you’ve got. Fortunately, there are coffee experts among us who can help us do just that. The other day, Matt and Liam from the Stumptown Annex gave me some good coffee advice that I wanted to pass along to you. I went to the Annex to buy some coffee to brew at home, and since I was buying good (and somewhat pricy) beans, I wanted make sure the beans were prepared properly. I have a very poor-quality blade grinder, so the question was: would be better to have them grind the coffee to the correct size, or should I take the beans home and grind them myself as needed? As you know, freshness is one of the most important factors that determines the taste of the coffee, but the grind is important too. Where was the trade-off between bean freshness and an accurate grind? The two coffee experts cleared things up. They told me that since I was using a French press, it would probably be better to grind the beans myself at home. With some brewing methods, having an even grind is of paramount importance. However, of all the brewing methods, the French press method is the most forgiving, and you can get away with some variation in the size of the grounds. If they were to grind the beans, many of the aromatics that give the coffee its richness would soon be gone. Therefore, they reasoned, freshness was more important and I should grind them myself at home. Sounded like solid advice to me. The two also gave me some advice on how to make the most of my rickety grinder (if you have a good burr grinder, you can disregard this). They were confident that I could still grind the beans well for the French press if I used a couple tricks. First, in order to get the best grind possible, don’t just set the grinder on the counter and turn it on. As you grind the coffee, shake the grinder up and down in order to keep the coffee stirred up. 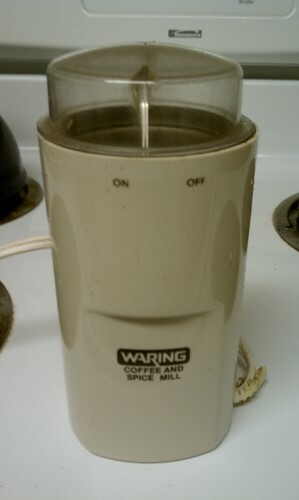 That way you will not end up with lots of finely-ground coffee at the bottom and coarsely ground coffee at the top. You should also pulse the grinder so that it does not continually run while you are grinding the beans. Pulsing will reduce the heat generated by the blades. You don’t want the grounds to heat up because the flavor compounds literally vaporize at higher temperatures, leaving you with a somewhat flat coffee. To help me gauge the right size, Matt sent me home with a sample of coffee ground with their commercial grinder, allowing me to compare my grind to the proper grind. This is something I recommend you do too if you are using a blade grinder. The baristas at your favorite café should be happy to grind some beans to the proper size for you to use as a guide. By following these tips, you might not brew the best pot of coffee you have ever had, but you will definitely make the most of your brewing equipment. Happy grinding and enjoy your fresh-ground coffee.